Sometimes we find ourselves in a financial pinch and we try to consider every way possible out of our current situation. If you have overwhelming debt, you might think bankruptcy is a good option. In the case of Chapter 7 bankruptcy, this may rid you of your debt for good. However, Chapter 13 typically requires a repayment plan. Regardless of the plan you consider, there are alternatives to bankruptcy. These alternatives can help you pay off debt without impacting your creditworthiness as long as bankruptcy will – often seven years or more. There are, of course, pros and cons of filing bankruptcy. On the positive side, you eliminate your debt. On the negative side, it can impact your creditworthiness and it may not rid you of all debt. For instance, student loans or back taxes are not usually eligible for inclusion in a bankruptcy filing. Bankruptcy may seem like the only option to wipe your slate clean. In some cases it may be, but there are alternatives to filing bankruptcy that can serve you better long-term. Here are the best alternatives to filing bankruptcy to help you pay off debt and get your finances back on track. Negotiating your debt is probably the best alternative to bankruptcy. I learned a long time ago that creditors just want to get paid something, making them willing to negotiate. Once you realize this, the next step is to begin calling all of your creditors to see what they are willing to do. Make a spreadsheet of every debt that you owe, the contact information for each creditor, and the interest rate, if any. Then call each one to see what they are willing to do. Sometimes you can get them to knock off 50 percent (or more!) of the debt just by asking. During negotiations, most creditors will tell you the same thing. While they are willing to knock down the amount of the debt by a certain percentage, you’ll have to pay it all either immediately or in a few equal installments. Since it is rare that you will be able to pay all your creditors at once and according to these terms, you need to choose which ones to tackle first. This is when you have to decide whether to take the debt avalanche or the debt snowball approach, But no matter what, keep making the minimum payments on the debts you can’t pay off right away. Doing this ensures that your credit score isn’t completely ruined. Be aware that often, the IRS does consider forgiven debt as taxable, so this may impact your taxes come tax time. If negotiating your debt seems too daunting for you, there are other options. Debt consolidation can be a great way to avoid filing bankruptcy. This is a similar process to negotiating debt, but instead of contacting each creditor, you choose one company to handle all of it for you. Avant is one company that can help you slash your interest rate by at least half. Even Financial is another option that lets you compare up to 17 lenders at once to find the best option. The lender you select guides you through the steps to consolidation. They obtain the information for all of your creditors and create a plan to consolidate those loans into one monthly payment. This not only makes your payment simpler, it gets creditors off of your back. Side hustling is my go-to trick for making extra money, The perk with side hustles is that there’s no limit to what you can do to bring in extra money each month. You can start many of them today. Even if you work a full-time job, you can have a side hustle or two rather than a part-time job. There are many other ways to make money on the side to help pay off debt. Earning extra money is one of the best alternatives to bankruptcy since it provides the additional cash you need to throw at your debt. This is one of my favorite options if you happen to own a house. In fact, I used a cash-out refinance many years ago to help eliminate of some debt, which gave us extra breathing room. A cash-out refinance means that using the equity in your house to get access to money. Typically, refinancing is promoted as an option for money to use for home renovations. But they don’t tell you what you actually have to use it for. In this case, you use the money to pay off your debts. This does come with risks, as it shifts the debt from other lenders to your mortgage. This may be worth it for you, but make sure to do the math. A traditional refinance, on the other hand, lets you potentially lower your interest rate and free up more of your budget to go towards debt repayment. You don’t have to stay with your original loan servicer; you can shop around to refinance. LendingTree is a good option if refinancing is the way you want to go. They let you compare offers from up to five different banks so you can find the one that works best for you. If refinancing isn’t a viable option because you owe too much on your property still or your credit score is shot, then selling your house can be an alternative to bankruptcy. I realize that is a very personal and emotional decision for most of us. I know that it was for me, but ultimately it was the best decision for us at the time. Sometimes owning a house is just more financial stress than it is worth. If you consider selling your property, do it right. The goal is to get the best price when selling your house because the more money you get for it, the more debt you can pay off. If you decided to use this option, the goal is to pay off everything. By selling your house, you should be able to pay off your mortgage and have money left over to throw at your debt. The hope is to be able to pay it all off. But even if you can’t, you should be able to pay off enough to breathe again. After starting with the big stuff, move on to the smaller stuff. There are plenty of ways to sell old stuff for money so take advantage of them. The goal is to get as much money as possible for the stuff you can willingly part with so that you can throw all of that money at your debt. As a highly independent person, this is my least favorite option. But I have had to do it. It was more painful for me to gather the courage to ask for help from my family than it was for them to actually loan me the money. But in times of great need comes great pride swallowing. Your family loves you and wants the best for you. I have found that if they can help, they will, even if it is just a loan that you have to pay back. It never hurts to ask family (and sometimes friends) to borrow money when you are in a tight situation. If you do find yourself asking to borrow money, then make sure that you have a game plan first. The people you are asking for money from want to know how the money is going to be used and what the plan is to pay it back. This option may be less likely for a lot of us than the other options here, but don’t rule it out completely. Because you never know unless you ask! Adding frugality into your lifestyle only helps when it comes to paying off debt. Not only can becoming more frugal help you pay off debt, but it can help change your mindset towards money. Changing your mindset means that you won’t inadvertently find yourself in this position again. One of the best ways that I have found to do this is with the envelope budget system. After paying your fixed expenses and debts, take what you have left and decide how much to put into each envelope each time you get paid. Once that money is gone, it is gone. You can’t add more until next payday. There have been plenty of studies performed about the psychology of how paying with cash differs from paying with credit. But the gist of all of these studies show the same thing; paying with cash is more emotional, and makes us think twice before spending it versus paying with a credit card. Therefore, pay for everything with cash. Once you transition to that, it will make things more transparent. Figuring out what your needs and wants really are can help reduce unnecessary and extra purchases. Sometimes you wind up cutting things you think you need because you simply cannot afford them. Things like beer and wine, which is sad, I know. However, sometimes those little luxuries are hard to justify when you are digging yourself out of massive debt. I know, because I have been there. But if you keep reminding yourself that it’s only temporary, it becomes a much easier pill to swallow. Filing bankruptcy is a huge, life-altering decision. Before making the decision to do so, exhausting every other avenue to avoid it is in your best interest. Ultimately, none of us want to be in debt, but we don’t ruin our credit either. So try everything else first! 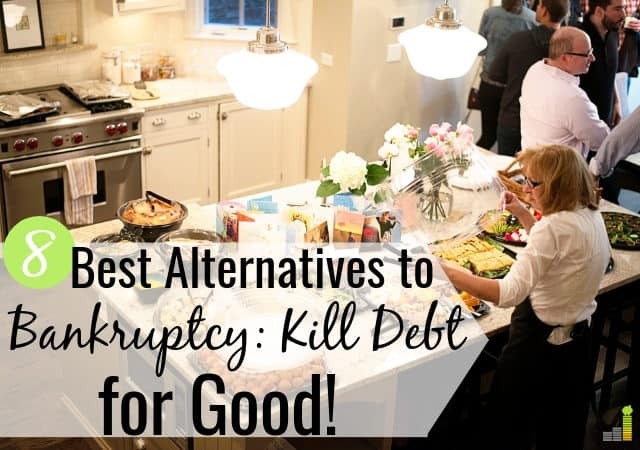 There are many alternatives to bankruptcy that either provide breathing room or kill debt for good. 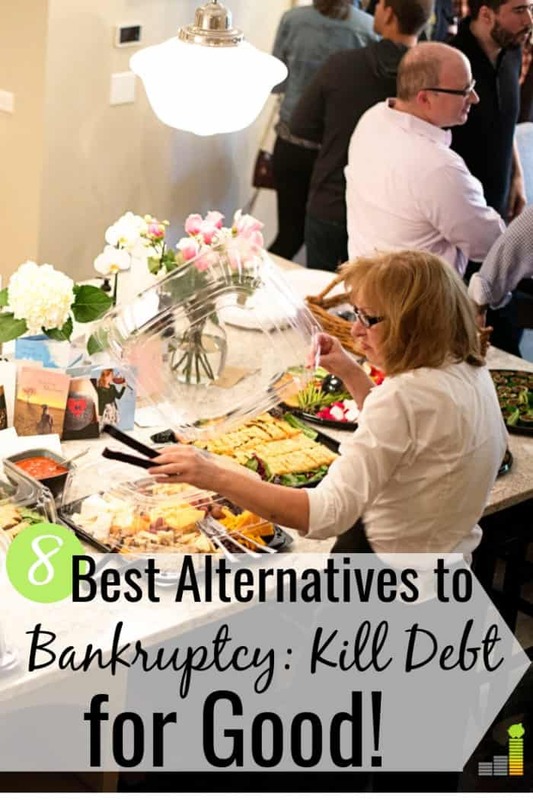 If trying any these alternatives helps you avoid bankruptcy completely, and creates more breathing room in your budget, then that is a win. What steps have you taken to avoid filing bankruptcy? Which tip had the most impact on your overall debt? What are some other alternatives to bankruptcy you have found helpful? While I’d agree that Dave Ramsey has helped a lot of people – the sentiment that he’s the only option out there is misguided. While many of his ideals are ones we’d stand behind, the simple fact is he doesn’t work for everyone. The point here is that there are many options out there to kill debt and avoid declaring bankruptcy. He doesn’t hold the secret to doing so. It really doesn’t matter, for the most part, what people facing this problematic situation do so long as they’re actively working to pay off debt.